Belle villa bien aménagée avec piscine privée, piscine communautaire, air conditionné et Wifi gratuit. Idéal pour les familles. Situation calme dans un complexe paisible proche du centre-ville Nerja avec des restaurants, bars et supermarchés. 5 minutes en voiture / 15 minutes à pied de la sélection des plages locales. 45 minutes en voiture de l'aéroport de Malaga. Grand plan ouvert salon salle à manger, cuisine bien équipée, 2 salles de bains Il ya et un WC séparé, de 2 terrasses avec tables et chaises et 6 chaises longues. A l'étage il ya 3 chambres, 2 avec balcon Juliette avec de belles vues. Parking extérieur de la villa ainsi que 2 garages. 2 WC. 2 salles de bains. Salle de bain 1 salle de bain et douche. Salle de bains 2 salle de douche. Lovely stay in Jean's villa in Nerja and Jean couldnt have been more helpful beforehand. We took our 2yr old daughter and Jean ensured that we had a travel cot and stair gates available to use during our stay and she enjoyed her time there and had a lot of fun. The villa is lovely with everything you need for a comfortable stay - the pool is great and clean and well maintained and the community pool which is a bit bigger, is right opposite the villa. It is in a lovely safe and quiet location with 2 supermarkets within walking distance as well as a number of restaurants/bars. The beach/town are also walking distance but a little further - around 20 mins, and Nerja town is fabulous with plenty of choice for food and shops/bars. Really enjoyed our stay. The only suggestion i would make is to have slightly thicker curtains in the front bedrooms as there is a bright light on the street outside - but i am just quite a light sleeper who loves a dark dark room...! Five of us stayed at this lovely villa for nearly two weeks and it was spacious, clean and with two bathrooms and three bedrooms it was very practical for us too. The area is nice and quiet which we knew as we have stayed in this area a few times before. The private pool is simply fabulous as it's fairly large and cleaned twice a week so we only popped to the main pool a few times which is literally just the other side of the street ! We don't hire a car as we prefer to walk on holiday but this is not a problem with two local supermarkets just down the road within easy distance. We ate in and out on alternate nights and with a front patio area and a grape vine pergola available we thoroughly enjoyed eating in and a couple of bbq's too ! We also found a delightful little cafe just down the road overlooking the sports stadium which we visited for the odd breakfast, lunch and afternoon coffee or beer ! There is a local chap as a contact in case of a problem but we didn't need him thankfully ! Air conditioning was available which we used at night and really helps keep you cool for a good nights sleep. There was good communication from the owner Jean who kept us informed and was only an e mail away if we had a question before our stay. 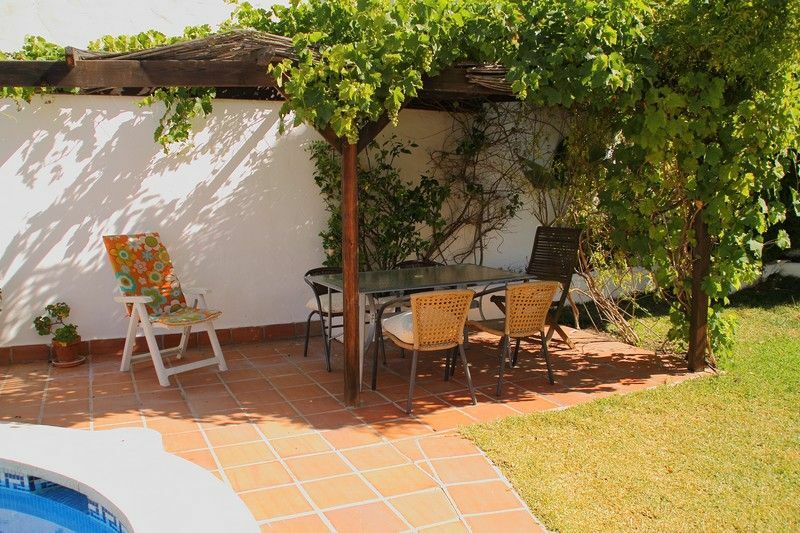 We would really recommend this villa to anyone needing that extra bit of space with children and maybe grandparents along too as in our case as everyone can escape to their own little corner for a read or just some chill time ! Miss it already ! Myself, my husband and daughter have just returned from a really relaxing holiday in Nerja. The Villa was perfect, everything you needed was at hand. set in peaceful surroundings, the pool was the icing on the cake. We loved to chill out in the garden under the pergalo. Perfect. Two supermarkets within 5-10 mins walk, and a bus stop into centre at the bottom of the road. The walk into the centre of Nerja was a pleasant 20mins, Coming back for me was a bit of a struggle, as I have asthma and it is up hill. I must say it was no problem for my husband or daughter. Jean the owner has been brilliant from start to finish. Nothing was too much trouble for her and the information she gave us was excellent. We have just returned from a lovely week at this property. It’s clean and well equipped. We particularly enjoyed the pool and community pool across the road kids had hours of fun there. It’s about a 15-20 min walk into town which is pleasant. Would definitely return. Lovely villa with own pool. Clean and well equipped. Lovely villa. Pool and communal pool warm and clean. 20 minute walk to central Nerja which was straightforward route . Very helpful owner who answered all our queries promptly and local contact who facilitated our late arrival time at the property. Really enjoyable holiday. 5 minutes en voiture (15 minutes à pied) à une sélection de plages. 45 minutes en voiture de l'aéroport de Malaga. 5 minutes à pied pacifiques bars / restaurants locaux. 5 minutes à pied de grand supermarché bien approvisionné. Booking Notes: 25% deposit on booking. Balance 8 weeks prior to departure. £100 damage deposit fully refundable within on return of keys Changeover Day: Please enquire.